SinisterCabbage had the most liked content! They are set up different because you have the triade set on Kanthal. When the wire is not replayable it shows boost instead of replay. So assuming your wire is replayable, the mod senses this automatically, set it to your own profile or pick a stock wire profile like ss316. I've been toying with the idea of using 1 watt increments cause it'd be better for myself as well. I left it that way because I wanted the theme to appeal to more people. 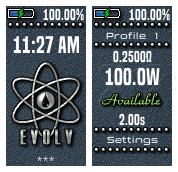 And I know you can go into eScribe and change it yourself About the battery icon, I actually made the battery icon in 256x256 cause my plan was to make it huge on the lock screen. Unfortunately whilst the DNA 250/75c is the finest chipset ever made the one thing Evolv messed up on was the amount of memory for themes. Pictures eat the memory and a half screen size full colour battery would actually take about 33% of it. It is my sincere hope Evolv double the memory on future releases, memory is cheap on the manufacturers end, I could make a truly stunning theme with double the memory. Welcome to ICONIC. Based this new menu system around icons so more information/options can be had in a smaller space. There are now 2 spaces on the main screen that you can configure to show 4 different options each. Works on the 250c and the 75c main screen is fully integrated to show wattage, Temp Control and replay. it comes in three colours blue, indigo and red. download the one you want or all of them. Going to redo the 75c theme in the next 24hrs apparently the 75 doesnt support power bank, toggles or replay so ill remove them. Then Once you get you replay update you can just download the 250 version. Once you have set your Field, change Source to Atomizer>Power. Press the options button next to it and you get decimal places and step size to play with. 2 versions in the download box now 250C and 75C. I took out the power bank features. I can't test it as i don't have a 75. There's a chance that the replay features might be causing conflict at the moment as you guys don't have it yet. If thats the case I guess you'll have to wait. 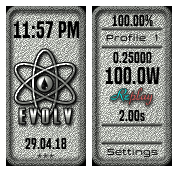 Latest i've heard on 75 Replay is that they have it fairly dialled in and have been getting nice stable numbers, but you know Evolv won't release it until its bang on. Sorry mate wasnt aware they had diferent settings. I'll find the differences and get them out in 75C format too. Paranormal Iconed Theme. Fully comprehensive menu system. Made the settings menu into a two page scroller to fit all the features in. I apologise i have after downloading a new default theme found the settings i was after. I'm almost 90% sure they weren't in the version i started this theme with ! 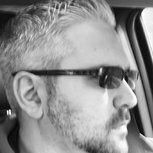 This post is specifically aimed at evolv / Escribe. and an administrator reply would be appreciated. However members should post if they have something relevant to offer. I do some web graphics design for a few programmer friends i have so i was quite excited to have at the new 250c's features to make some nice themes for it. I have posted one in the download section called Black Cabbage. I have since found that moving the labels and fields about to have it looking nice is an absolute no no. Specifically moving the ohms reading in the top left corner (which becomes Power in Replay mode), then moving the battery icon to that space causes a conflict with hidden fields that control Replay. Therefore causing replay not to work. The main problem i have is that no access is offered to these hidden fields in Escribe so that i may move them too and resolve the conflict. Can someone of power confirm my findings and let me know wether i must live within the constraints when theme making or wether you can patch Escribe to allow themes like Black Cabbage to provide all the features. Especially since no replay is a real theme deal breaker. Thanks Muchly.